Thanks to her massive number of entries for guessing the video shoe guru and posting a link to the contest on her site, Farren has won the alice+olivia shoes from Payless! Congrats, Farren! We're going to want pictures, lots of pictures of you in the fabulous boots. And hats off to all you other size 8's who played, but especially Sal, whose birthday was last weekend. Happy belated birthday, Sal, and I'm keeping my eye out for you at every Payless I pass! 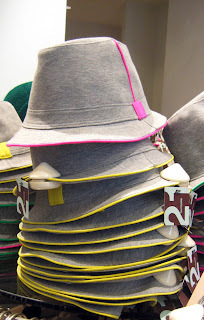 Many hats to take off at 34th St. Forever 21, $9.80, 2nd floor by dressing rooms. And a teaser for tomorrow's post, "I was a Teenage Heavy Metal Groupie." 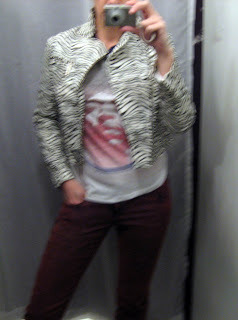 Cropped zebra moto jacket, 34th St F21. Last one on rack in front of doors. LOVE that jacket! Great find. That jacket is hawt. And would look good with my zebra stud earrings. Let's make the purchase of those mandatory with the jacket. yay! i am nearly going to cry -- i am definitely going to be having a ton of pictures with those boots on! would you like me to e-mail you my address? i can't wait to see the teenage heavy metal groupie post tomorrow! wow! 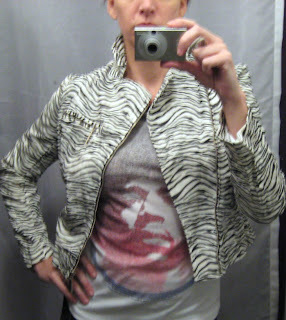 love that zebra jacket!!! how is the cold treating you? Fortunately I'm in Miami hiding from the snow! However I miss my city! ps- did you hear about the plane crash in the Hudson river? I would have played if my feet weren't so dang big!